Get CNA certified – and learn the skills you need to provide high-quality care to residents in long-term care facilities, hospitals, home health care and hospice settings. At the American Red Cross, our CNA certification program is designed with input from educators, caregivers and industry representatives from across the United States, so you can stay at the forefront of patient care. As the premier provider of certified nurse assistant (CNA) training, we've prepared individuals for work in the nursing field for over 100 years. And with our convenient, innovative programs, we can help you embark on a new career in the healthcare industry. For complete details on Red Cross CNA certification training available in your area, browse our course availability information. 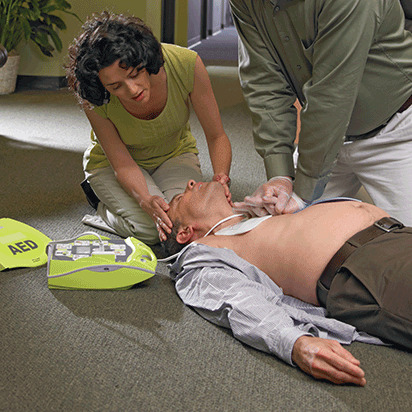 In addition to offering CNA certification training, the American Red Cross is also approved to award continuing education units (CEUs) in Preparedness and Health and Safety Services courses, such as CPR/First Aid/AED, CNA training, swimming and water safety, lifeguarding, wilderness and remote first aid, etc. Explore our complete list of eligible CEU training. 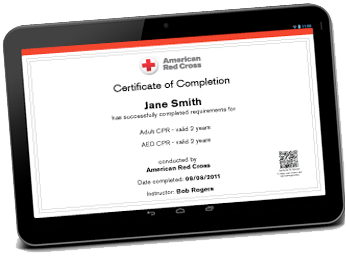 When you become certified in CPR, first aid and other skills from the American Red Cross you'll get anytime, anywhere access to your Red Cross Digital Certificates; plus the ability to print, share, and download them wherever and whenever you like. Digital certificates can be viewed, printed or shared online and can be accessed anytime through your Red Cross Account. Each certificate includes a unique ID and a QR code which meets employment requirements and allows employers to easily confirm your certificate is valid. Class participants and employers can visit redcross.org/confirm and enter the ID found on the digital certificate (or scan the QR code with a standard QR reader using a smart device) to access a copy of the valid certificate with student training information. To locate your certificate go to redcross.org/take-a-class/digital-certificate and search by email, name or cert ID.